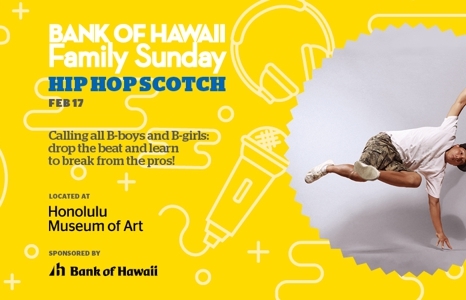 Kids can experience Honolulu's hip-hop culture with live performances and workshops. Activities end at 2pm, but the museum remains open free of charge until 4:30pm. • Who Am I? Kids can create their own personalized name posters using different bubble letters. They can add their own letters and words around their poster to represent who they are. • Sunny Day: Make and decorate your sunglasses to keep yourself looking cool and staying safe in the sun. 12:30pm: Keiki Breaks. Watch the kids of Keiki Breaks bust a move on Central Courtyard Stage. 1-2pm: Super Groupers. MCs Navid Najafi, Illis It and beat maker Ohtoro are a Hip Hop collective from Honolulu in love with lyricism, beats, originality and positivity! Enjoy our full-service Sunday brunch menu at the Café from 11am-2pm. Reservations are recommended. Take a shuttle bus to the museum’s free Family Day at Spalding House in Makiki Heights for more art and fun. Open to kids age 1 to 17, the contest station features drawing supplies where participants create a drawing based on a theme. The winner receives a Supporting Membership to the Honolulu Museum of Art ($120 value), and his or her artwork is used to create the following month’s event brochure and is posted on the museum's website. 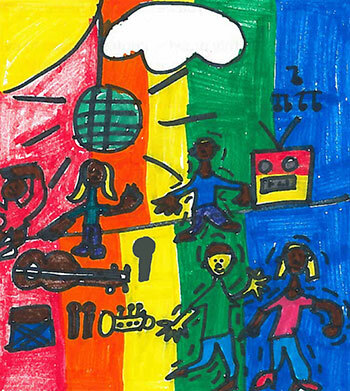 Congratulations to last month's winner, Rylan Young, age 8, from Makiki!